Stephen Hawking, whose brilliant mind ranged across time and space though his body was paralyzed by disease, died early Wednesday, a University of Cambridge spokesman said. He was 76 years old. Hawking died peacefully at his home in Cambridge, England. The best-known theoretical physicist of his time, Hawking wrote so lucidly of the mysteries of space, time and black holes that his book, "A Brief History of Time," became an international best seller, making him one of science's biggest celebrities since Albert Einstein. "He was a great scientist and an extraordinary man whose work and legacy will live on for many years," his children Lucy, Robert and Tim said in a statement. "He was a great scientist and an extraordinary man whose work and legacy will live on for many years. His courage and persistence with his brilliance and humour inspired people across the world. He once said, 'It would not be much of a universe if it wasn't home to the people you love.' We will miss him forever." 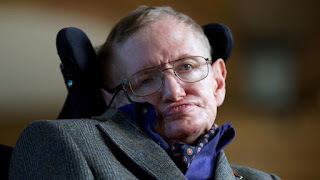 Even though his body was attacked by amyotrophic lateral sclerosis, or ALS, when Hawking was 21, he stunned doctors by living with the normally fatal illness for more than 50 years. A severe attack of pneumonia in 1985 left him breathing through a tube, forcing him to communicate through an electronic voice synthesizer that gave him his distinctive robotic monotone. But he continued his scientific work, appeared on television and married for a second time. As one of Isaac Newton's successors as Lucasian Professor of Mathematics at Cambridge University, Hawking was involved in the search for the great goal of physics — a "unified theory." Such a theory would resolve the contradictions between Einstein's General Theory of Relativity, which describes the laws of gravity that govern the motion of large objects like planets, and the Theory of Quantum Mechanics, which deals with the world of subatomic particles. For Hawking, the search was almost a religious quest — he said finding a "theory of everything" would allow mankind to "know the mind of God." "A complete, consistent unified theory is only the first step: our goal is a complete understanding of the events around us, and of our own existence," he wrote in "A Brief History of Time." He followed up "A Brief History of Time" in 2001 with the more accessible sequel "The Universe in a Nutshell," updating readers on concepts like super gravity, naked singularities and the possibility of an 11-dimensional universe. Hawking said belief in a God who intervenes in the universe "to make sure the good guys win or get rewarded in the next life" was wishful thinking. "But one can't help asking the question: Why does the universe exist?" he said in 1991. "I don't know an operational way to give the question or the answer, if there is one, a meaning. But it bothers me." The combination of his best-selling book and his almost total disability — for a while he could use a few fingers, later he could only tighten the muscles on his face — made him one of science's most recognizable faces. He made cameo television appearances in "The Simpsons" and "Star Trek" and counted among his fans U2 guitarist The Edge, who attended a January 2002 celebration of Hawking's 60th birthday. His early life was chronicled in the 2014 film "The Theory of Everything," with Eddie Redmayne winning the best actor Academy Award for his portrayal of the scientist. The film focused still more attention on Hawking's remarkable achievements. His achievements and his longevity helped prove to many that even the most severe disabilities need not stop patients from living. Richard Green, of the Motor Neurone Disease Association — the British name for ALS — said Hawking met the classic definition of the disease, as "the perfect mind trapped in an imperfect body." He said Hawking had been an inspiration to people with the disease for many years. Although it could take him minutes to compose answers to even simple questions Hawking said the disability did not impair his work. It certainly did little to dampen his ambition to physically experience space himself: Hawking savored small bursts of weightlessness in 2007 when he was flown aboard a jet that made repeated dives to simulate zero-gravity. Hawking had hoped to leave Earth's atmosphere altogether someday, a trip he often recommended to the rest of the planet's inhabitants. "In the long run the human race should not have all its eggs in one basket, or on one planet," Hawking said in 2008. "I just hope we can avoid dropping the basket until then." Hawking first earned prominence for his theoretical work on black holes. Disproving the belief that black holes are so dense that nothing could escape their gravitational pull, he showed that black holes leak a tiny bit of light and other types of radiation, now known as "Hawking radiation." "It came as a complete surprise," said Gary Horowitz, a theoretical physicist at the University of California, Santa Barbara. "It really was quite revolutionary." Hawking's other major scientific contribution was to cosmology, the study of the universe's origin and evolution. Working with Jim Hartle of the University of California, Santa Barbara, Hawking proposed in 1983 that space and time might have no beginning and no end. "Asking what happens before the Big Bang is like asking for a point one mile north of the North Pole," he said. That new theory capped his three-decade struggle to explain a paradox in scientific thinking: How can objects really "disappear" inside a black hole and leave no trace, as he long believed, when subatomic theory says matter can be transformed but never fully destroyed?